SpaceX’s triple-core monster rocket leapt off its LC-39A Launch Pad at Florida’s Kennedy Space Center at 20:45:00.49 UTC on February 6, 2018, embarking on a long-awaited shakedown mission and in the process becoming the most powerful rocket currently in service. Falcon Heavy successfully achieved orbit after eight minutes of powered flight and returned stunning video of its payload circling Earth – a midnight-cherry Tesla Roadster from Elon Musk’s personal collection, now ‘driven’ by a mannequin dressed in a SpaceX Space Suit and ultimately heading for a solar orbit. 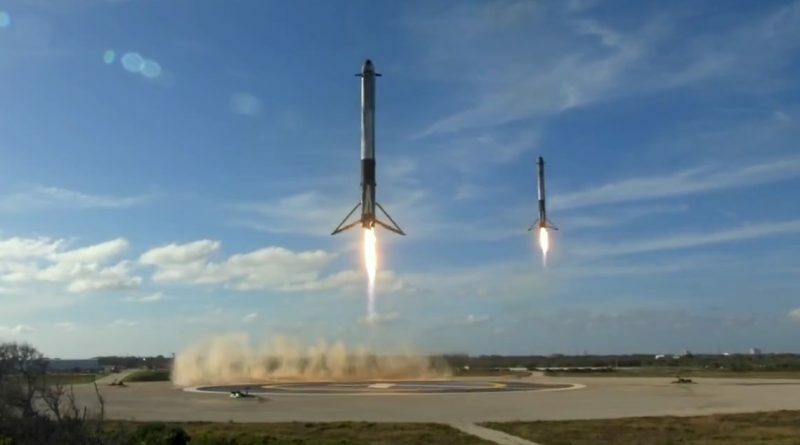 The two Side Boosters of the vehicle landed back at Cape Canaveral in science-fiction-like fashion while the rocket’s Core Stage was lost during its daring landing attempt at sea after running out of igniter fluid.